Swine flu is a form of influenza virus infecting pigs. It is an extremely transmittable subtype of Influenza A viruses which causes respiratory complications. 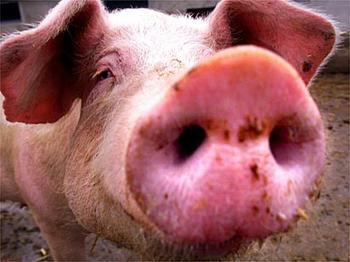 Mortality rate of pigs infected from swine flu is roughly around 1 percent to 4 percent. This virus spreads among pigs by direct and indirect contact, from aerosols and from already infected pigs. Normally, H1N1 influenza A virus subtype is the cause of swine flu. However, other types such as H1N2, H3N1, and H3N2 can also cause the flu. The H1N1 type though not as dangerous as some other subtypes, has infected the humans in the recent outbreak of swine flu. Symptoms of H1N1 influenza are similar to seasonal human influenzas which vary from placid or no symptoms at all to severe and perhaps deadly pneumonia. Since symptoms of swine flu are almost similar to symptoms of common seasonal human flu and other upper respiratory tract infections, identification of swine flu in humans occurs rarely. And when it is detected it is generally merely by chance through seasonal influenza examination. The detection of swine flu among human depends largely on range of symptoms evident. If symptoms are mild, it is very unlikely that any association to swine influenza is found, even if it is present. Therefore, swine flu is detected only in cases where doctors and experts are suspecting it and diagnosis is done specifically for swine flu. Due to this reason, it is very difficult to come up with true human infection rate by swine flu. Since 2007, the cases of swine influenza have been notified from the USA and Spain. In 2009, human cases of H1N1 influenza A swine flu were first reported in California and Texas, later cases from other states also became evident. A considerable number of human cases have been reported in recent time throughout various parts of the world. The most common ways of spread of swine flu in humans is from contact with infected pigs. Very rare cases are reported that acquire infection from contact with infected humans. In cases where infection was transmitted from one human to other humans, close contact was essential with the infected person and they almost always take place in closed groups of people. The signs and symptoms of swine flu are similar to those of seasonal human influenza such as: Body aches, Chills, Cough, Fever, Headache, Sore Throat and Fatigue. Diarrhea and vomiting are less common symptoms of swine flu. There are some drugs or antiviral agents available in market that can successfully treat swine flu infection in humans and also many types of human flu infections. Adamantanes (amantadine and remantadine) are commonly prescribed antiviral drugs, neuraminidase (oseltamivir and zanamivir) serve as inhibitors of influenza. However, most preceding swine influenza human cases recuperated entirely without the need for medical attention. Before the annual flu season starts, one should know the protective measures to defend oneself from both the H1N1 influenza virus and the common seasonal flu since contamination of both can possibly lead to dangerous health effects especially people with unhealthy immune systems. • Wash your hands thoroughly and regularly with antibacterial soap. This easy measure often accounts to the most effective protection measure against the spread of any type of influenza, infection or virus. Using an alcohol-based hand sanitizer is a fast and simple way to get rid of germs between washings. Make habit of washing or sanitizing hands immediately after coming into contact with a sick/infected person. • Stay away from sick people and from crowded areas if there is a swine flu outbreak in the vicinity. Persuade children and adults to cover their mouths and noses with tissue while coughing or sneezing. Try to maintain a safe distance with the infected or sick person. Also refrain from touching surfaces that may be contaminated with virus. Lifestyle habits play a significant role in assessing a person’s vulnerability to cold, influenzas and other illnesses. By modifying daily lifestyle routine, people can greatly lower their risk of catching influenza or acquiring other illnesses. A healthy lifestyle ensures a healthy body and mind which act as protective shield against infectious agents and rebuff the harmful effects. It is rightly said that a strong immune system and infectious disease cannot exist together. Therefore, the condition of your immune system determines the susceptibility of human body to get infected when it comes in contact with the germ, virus or bacteria. Maintain adequate level of Vitamin D: Many people throughout the world lack vitamin D in their body, which is required to activate the immune system to do its job of defending body against infections and illnesses. Vitamin D produces over 200 antimicrobial peptides, the most vital of which is cathelicidin. It is a naturally occurring broad-spectrum antibiotic. It has been proved by at least five studies that there is an inverse relationship between lower respiratory tract infections and vitamin D levels which means the higher the vitamin D level in body, the lower is the risk of contracting colds, influenza and other respiratory tract infections. The most common source of Vitamin D is exposure to sun. In the fall and winter when sun rays hardly reach earth surface, use of safe tanning bed is permitted. The least suggested way to augment your vitamin D level is by taking a supplement. The majority of adults need 8,000 units to attain beneficial levels and some require much more. With exposure to sun or tanning bed, a human body can absorb up to 20,000 units. Maintaining adequate levels of Insulin and Leptin: Intake of sugar, fructose and grains increase body’s insulin level, which makes body more vulnerable to diseases and also premature aging. Leptin is another heavyweight hormone connected with disease and the aging process. Similar to insulin levels, if leptin levels of body become eminent then body systems will build a resistance to this hormone, which will cause chaos in body. Improve your eating habits by eating healthy diet minmizing grains and substituting them with lean proteins, vegetables and fruits to provide the power to the body to fight the H1N1 virus. A nutrition plan based on natural whole foods and reduction of intake of grains, fructose and sugar in the diet is first and foremost step in optimizing insulin and leptin levels in body thereby increasing chances of living a longer, healthier life. This is also vital for flu prevention since sugar decreases the function of immune system. Eating plenty of Raw Food: Eating food in its natural raw state is one of the most important aspects of a healthy diet. Unfortunately, nowadays, processed food has become major part of diet of nearly 90 percent of population and eating these kinds of denatured and chemically altered foods have brought about an epidemic of chronic and degenerative diseases and therefore, way too many cases of colds and flu. Ideally a healthy diet contains foods in their unprocessed state; usually organic, biodynamic foods that have been produced locally and are seasonal. Eating the best foods available in market does not necessarily make human body healthy since most of the nutrition is destroyed when food is cooked. So, it is wise to strive to include as much raw food in the diet as possible. Regular Exercise: Studies have shown that exercising regularly decreases the probability of acquiring the flu or other viral illness quite dramatically. One such study revealed that living an active life cuts the risk of acquiring cold by 50 percent and the severity of symptoms by 31 percent among those who did catch a cold. The researchers noticed that each round of exercise leads to improved circulation of immune system cells in blood that further aids in protection against a virus. The function of these immune cells is to defuse pathogens throughout the body. The improved circulation of these cells makes immune system efficient in locating and protecting against viruses and diseases trying to threat the body. Thus, people should treat exercise as a drug which must be correctly prescribed, observed or monitored and maintained to enjoy most benefits. Basically, a varied routine including high-intensity interval exercises like Peak Fitness is more beneficial. Coping effectively with Stress: Stress immensely influences the function of the immune system, which is why, it is evident that a person is more likely to acquire cold or flu when under loads of stress. Both the acute stressful episodes (working over a big project in work) and chronic stress (relationship troubles) deteriorates the immune system and leave it incapable to ward off infectious agents. Emotional stressors can aggravate the symptoms of cold and flu in case the person is already sick. So, taking time out to de-stress your life and winding down with stress management tools like exercise, meditation, massage, and participating in social support groups, can be very beneficial. By adhering to these guidelines a person can optimize both the health and immune function, and minimize the risk of the swine flu and other infectious disease.